First, take ten minutes to read the Buyer’s Guide to Olive Oil in North America from the website, Truth in Olive Oil, by Tom Mueller, the author of the book, Extra Virginity: The Sublime and Scandalous World of Olive oil. Then go to a specialty store where you can taste many different olive oils and get detailed information about each oil, as shown here (scroll down for chemical composition related to freshness and nutrition). After tasting many distinct olive oils, you will discover your favorites. If you live in the DC area, you are fortunate, because you can easily stop in for a visit at Under the Olive Tree, a “delicious” store located in the Tyson’s Corner Mall. Here you can sample carefully selected, top-quality, single variety, extra virgin olive oils, including those that have been certified by the new Ultra Premium Extra Virgin Olive Oil certification program (UP). The oils certified by this program are the best of the best and only available currently in 15 stores nationwide. And while you are at Under the Olive Tree, you will probably meet and talk with at least one of the owners of this family business, a charming couple and their daughters who are friendly, knowledgeable, and passionate about olive oil — and on a mission to offer products you can trust and an experience you will enjoy. Is there a food or recipe doesn’t benefit from some garlic? OK, maybe that dessert you’re dreaming about. But just about everything else is enhanced by garlic! So I keep Homemade Garlicky Olive Oil in my refrigerator at all times. It’s easy to make; just takes three common ingredients to make garlic flavored olive oil safely – without creating a medium for botulism to grow. Peel the garlic and trim off the end close to the root where bacteria are likely to hide. In a food processor fitted with a metal blade, process the garlic until it’s very finely minced. 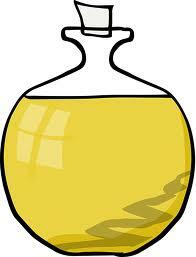 Pour some olive oil into a glass dish (not plastic). Then pour some water into a slightly larger glass dish. 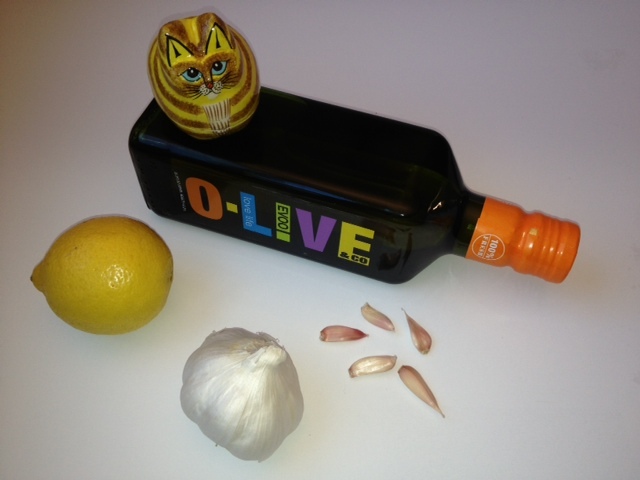 Take the dish with the olive oil and place it into the dish with the water. Now you have a water bath for gently heating your olive oil! Note: The water in the larger dish should reach only up to the the level of the olive oil (in order to keep the water from sloshing into the oil when you move the dishes). 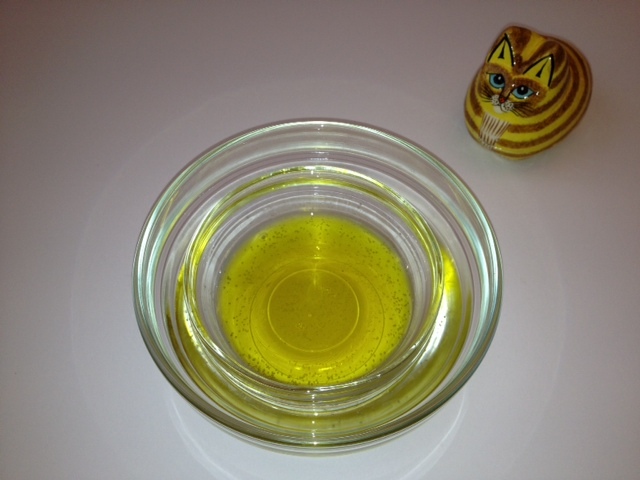 Place the olive oil in its water bath and then into your microwave; heat it on the medium or high setting. Let it get hot, but do not let it boil. The amount of time time it took at the high setting to heat the small amount of olive oil that you see in the photo was 30-40 seconds. Put a few spoonfuls of the finely minced garlic into the hot oil; mix. Add the lemon juice; mix. Let the garlic, olive oil, and lemon juice mixture sit in the water bath for 10 – 15 minutes. FOOD SAFETY TIP – Before you head to your kitchen, please read this Food Safety Tip! When you combine garlic and oil, you create an environment in which botulism (a deadly food-born bacteria) can grow. According to the University of Colorado Extension Service, to prevent the possible growth of botulism when mixing oil and garlic, you should always “add an acidifying agent such as lemon juice or vinegar to the recipe at the rate of one tablespoon per cup of oil.” Also you should “discard infusions after one week, or sooner if apparent cloudiness, gas bubbles, or foul odor develop. For more information about garlic and botulism, and how to be sure your cooked or raw chopped garlic in oil is safe for consumption, see this ChefTalk post. 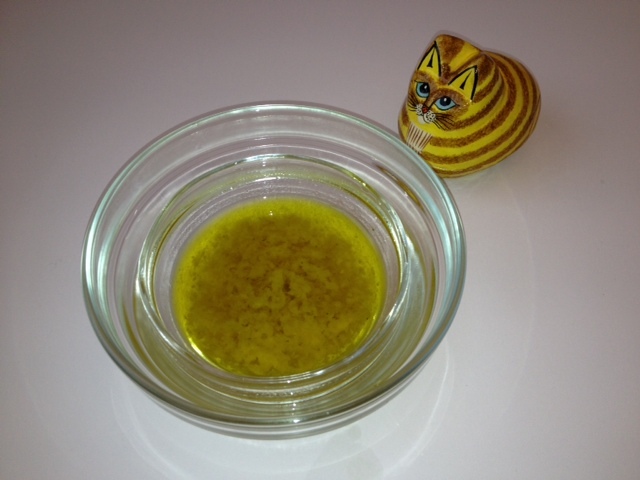 Add both garlic and oil to a recipe, for example, when making a Fresh Herb Sauce. Add flavor to a simple sautéed food, for example, a piece of fish or a vegetable, such as Beet Greens. Just top the sautéed beet (or other) greens with Homemade Garlicky Olive Oil. And..by adding the garlic to your food AFTER cooking, you can’t burn the garlic ᕙ(`▽´)ᕗ!